← Join the Grocery Run Team! Anne LaMott once wrote that there really are only three prayers, THANKS, HELP and WOW, (maybe not necessarily in that order.) After today’s experience at leading the DRM , I want to tell you that I think she might be on to something. I have 11 or 12 people on my DRM team. For lots of good reasons, 6 people, including our “head cook” couldn’t be with us, and, at the last moment, another team member wasn’t able to come. We also knew that lately the attendance had been high, close to 100. The menu was chili, which requires lots of preparation. No substitutes were in the picture. Time for the HELP prayer for sure. Around 9:45 am, I found myself in the kitchen, by myself, locating the supplies, lighting the oven, starting the dishwasher (stuff I never have had to do!) Mark appeared; I put him to work chopping veggies for the salad. Ellen and Sue appeared and that was it. The folks who would set up the dining room would come in later, but for now we were the only folks on board. Suddenly, somebody tapped on the kitchen window. “Who is this? ” I thought? I went to the door, and—- there was the Fischell family; Bob, Pat, Julian and two of Julian’s friends, Drew and Andrew! The Fischells are longtime members of the Batchelor team, who thought that they were supposed to work on Ginny’s team for today! After we figured out what had happened, they came in, helped to cook, served, washed pots and pans, helped with the dish washing —everything! Nancy Gongloff also came for the first time! And, instead of 100 plus guests, as in the last two weeks, we smoothly served 75 pleasant guests and made some new friends. Two of our guests, Jim and Dominick, offered to help. 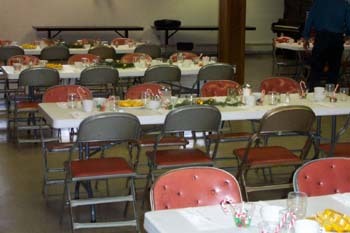 They put away chairs, wiped down tables, swept the floors and mopped the dining room. They gave us their names and phone numbers; they will try to come every week. I guess it’s obvious what part of the prayer came next. Thanks not only to all the people, guests and team members, who made this DRM time such a smooth, caring and fun experience, but to the Holy Spirit, who seemed to me to be with us all through the morning. I can’t tell you how grateful I am to have been a part of this experience, and to our church, for creating the opportunity to show God’s love in this way. This entry was posted in Uncategorized and tagged Dining Room Ministry, DRM, Food, Hunger, Outreach. Bookmark the permalink.